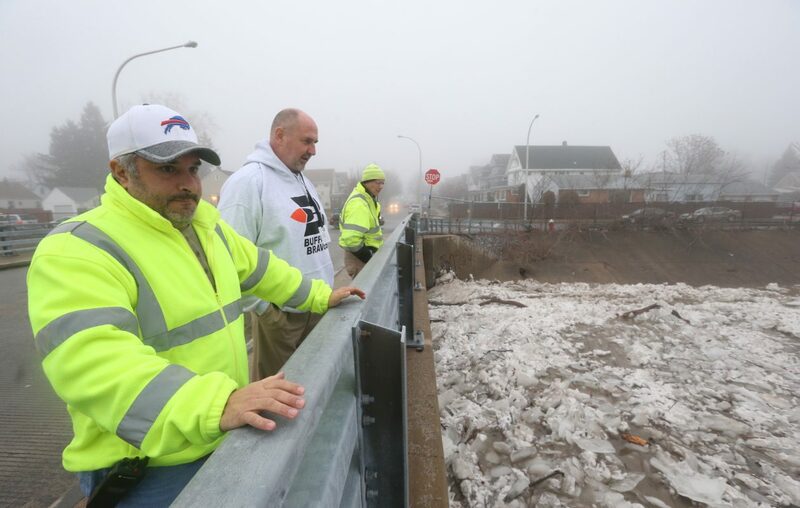 Steven J. Stepniak – Buffalo’s commissioner of public works – has been a familiar face around City Hall for 32 years, particularly during snowstorms like the one that hit this week. He’s the guy at the podium with the mayor giving updates on the city’s snow preparedness, and the one who helps devise the master plan for clearing streets and making Buffalo drivable. In the spring and summer, he gives flooding updates and coordinates the filling of potholes and the repaving of city streets. He also supervised the $6.22 million renovation of the former Dillon federal courthouse into the new headquarters for the city's police and fire departments. But Stepniak – who said he's the longest-serving commissioner under Mayor Byron W. Brown – won’t be around City Hall much longer in an official capacity. During a Thursday afternoon press conference to give an update on the city's storm response, Brown announced Stepniak's retirement. “This planned retirement after 32 years with the City of Buffalo – 11 of those years as commissioner of the Department of Public Works – was scheduled for this week, but it is fitting that Commissioner Stepniak would be retiring in a week in which he is concluding his career fighting a blizzard in Buffalo and Western New York,” Brown said. Noting that Stepniak "is literally working up to the last moment of his retirement," Brown lauded his "tremendous work ethic" and noted that he often worked around the clock when severe weather hit. “We’re very fortunate to have had him working for the city for 32 years,” Brown said. Common Council members had nothing but praise for Stepniak. “He has been an integral part of City Hall and the reason that this city is running so well as far as the Public Works Department,” said Council President Darius G. Pridgen. It is expected that Michael J. Finn, the deputy commissioner and city engineer, will take over. It should be a smooth transition. For a couple of years, Stepniak has been planning his retirement, grooming his staff to take over seamlessly. Stepniak, who turned 55 last week, started as a general laborer in the Public Works Department in 1987 and never looked back. He rose through the civil service ranks, and in 2007 Brown appointed him interim commissioner to replace someone who'd been caught up in scandal. The following year, Brown named him commissioner. “I’ve done every job in that department,” Stepniak said. And there’s a lot to do in the department. Public works is responsible for everything from repairing water main breaks on an aging infrastructure to collecting trash and recycling items, to planning, designing, repairing and constructing city-owned buildings. It also oversees tree grooming on city property, inspecting and maintaining bridges, operating the city’s animal shelter, and managing the city’s parks, recreation centers, pools, splash pads and skating rinks. And the list goes on. Before becoming commissioner, Stepniak served in posts ranging from senior city engineer to director of street cleaning and snow removal. Before his City Hall career, Stepniak was a baseball standout at McKinley High School and Canisius College. He played for two years in the Cleveland Indians organization, before a severe rotator cuff injury ended his baseball career. In 2010, he was inducted into the Western New York Baseball Hall of Fame. He credits his mother, Regina, who's in her early 80s, with helping him become a professional baseball player. "She was the one who got me to all my baseball games when I was a kid," he said. "She has always been the rock and strength of the family." "There are a bunch of other opportunities I'm pursuing," he said, though he wasn't ready to go into specifics. “A lot of people have been reaching out to me. I will not do anything with contractors and consultants I worked with here” in City Hall.